Place your head in a pool of your own screen-printed blood as you dream of being ripped to shreds by a zombie horde. 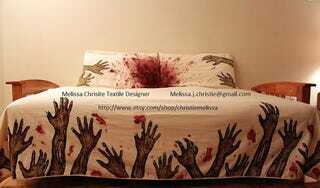 We love these zombie bed linens by Melissa Christie, deeply. For sale over at her Etsy page the duvet cover and pillowcases are modestly price for such awesome undead gore!